Cryptonex (CXN) is the coin native to the Cryptonex exchange platform and wallet service. Created to facilitate faster transactions between both fiat and cryptocurrencies, the platform already supports a number of fiat currencies as well as some lesser known coins. It also offers peer-to-peer trading with minimal fees, as well as payment gateways for merchants looking to start accepting cryptocurrencies for their work. Cryptonex is a global cryptocurrency exchange platform and wallet service powered by the eponymous coin. The main goal of the platform is to offer the opportunity to exchange any world’s currencies for any cryptocurrencies and tokens, pay for goods and services using mobile phones and payment cards instantly, with minimum commission. Cryptonex is based in Switzerland and is created by an international team of Financial Investment Group which mainly specialises in software development for financial markets. It was founded by Pavel Kalinin, currently listed as Managing Director of Cryptonex. The platform allows its users to buy Bitcoin (BTC), Ethereum (ETH), and Cryptonex (CNX) using various fiat currencies like USD, GBP, EUR, and Russian Ruble. Plus, you can use Visa or MasterCard to make purchases on the platform, though using a credit/debit card attracts higher fees. 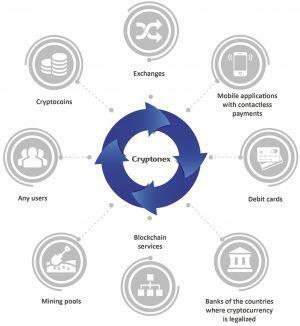 It also has a P2P exchange system, where the Cryptonex platform acts as guarantor and the transactions happen individually, both online and offline. If you prefer offline, the individual who placed the ad for buy/sell will choose a place to make the transaction. The company held an ICO throughout the month of September 2017, when one CNX coin went for 0.0005 BTC or 0.007 ETH. 85 million CNX coins were available for purchase through the ICO. Although there is no data as to how many coins remained unsold, the company promised that they would be moved to a cold wallet and “sold to banks in accordance with demand” during their planned expansion. As of October 2018, the company is working on listing NERVES on its P2P exchange, in the invoice and cards services, as well as their multi-currency wallet. Nerves, calling itself the “Neuronet of things,” is a blockchain service working on connecting all blockchain networks together as one. They are also working on listing ThingsChain in the same manner. ThingsChain is a next-generation platform for IoT devices based on blockchain technology, with its TIC token ranked 507th by market cap in October 2017. Cryptocurrency exchanges are not exactly a groundbreaking concept, so Cryptonex has its fair share of similar projects. The table below showcases the differences between Cryptonex and some main competitors. There is currently more than 55 million CNX tokens in circulation, while the total supply stands at around 107 million as of October 2018. The maximum supply is 210 million CNX coins. The Cryptonex team owns 5 million CNX. Currently standing at slightly above USD 2, the all-time high of this cryptocurrency was close to USD 10 at the end of January 2018 - a loss of 80%. Its market cap is more than USD 117 million, ranking it 56th in October 2018. The transaction fees are also negligible at 0.0001 CNX, and the company claims to be able to process 15,000 transactions per second. The coin can also be mined, which we will talk about further below. The coin uses the Proof of Stake (PoS) consensus mechanism. This concept states that a person can mine or validate block transactions according to how many coins they hold. This means that the more coins owned by a miner, the more mining power they have. Since Cryptonex uses PoS as a consensus mechanism, mining is different than the usual Proof of Work (PoW) method, used by Bitcoin among other coins. Although PoS mining is most often called staking, Cryptonex prefers the term “mining.” According to their website, the profit is 12% annually from the staked amount, plus any commissions from the transactions your wallet will confirm. However, all the deposits are kept in a single pool which charges you 1% - so your annual profit is actually 11%. The single pool “significantly increasing the rewards frequency for POS mining,” their website states. To get the mining rewards, you will need to register a web wallet, buy CNX coins, transfer the coins to the desktop wallet and keep it online as long as possible. When freezing funds for 1 year, the deposit bonus is 20% of your amount. Rewards are deposited daily, and to be eligible for it, your minimum stake age has to be one hour. There is no maximum stake age. The platform offers its own desktop wallet for keeping your CNX and other coins secure. The multi-currency wallet currently supports Cryptonex, Bitcoin, Ethereum, Ontology, Brazilian Real, Euro, British Pound, Russian Ruble, and the US Dollar. You can top up your wallet balance using a QR-code or by a direct deposit to the wallet address, and you can exchange all the supported currencies in the wallet. Cryptonex also offers two types of prepaid cards for its users: a nominal card and a chargeable card. Checking the card balance on either one of those will not activate the card, meaning you can deposit it whenever you want by activating it manually. The nominal cards are issued with the nominal of 1, 2, 10, 20, 50, 100 CNX, giving it this name. The chargeable card, as its name implies, can be topped up with any supported cryptocurrency from your account. This means you can give and receive cryptocurrency in the real world using prepaid cards in any country.